Swap adjacent blocks to line up 3 or more of the same type of candies next to each other horizontally or vertically to make a match. 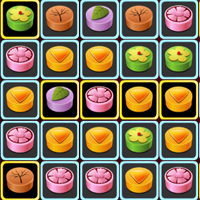 Each time you make a match tile will change its color. To clear a level make all the tiles yellow.This is an ad free game.This is an Ad Free Game.